In 1988, at the dawn of the “Lean” era (LE), The Kaizen Institute of America held a very important seminar on the Toyota Production System and kaizen at The Hartford Graduate Center (now Rensselaer) in Hartford, Connecticut. Click on the image to view the historic brochure used to advertise the seminars more than 25 years ago. Click on image to view brochure. Among the attendees were representatives of Danaher Corporation, which earned notice in subsequent years for their success with the Toyota Production System (TPS). They included: George Koenigsaecker (president) and Bob Pentland (vice president) of Jacobs Manufacturing Company, and John Cosentino and Art Byrne who were Danaher group executives (Byrne would later become president and CEO of The Wiremold Company). These executives, and many other Danaher alumni, would go to lead Lean transformation in dozens of other organizations across the United States and around the world. It is noteworthy that these four men were high ranking executives, while nearly all other attendees were lower ranking personnel. This illustrates an eagerness among seasoned executives to learn new things, something that is often missing in today’s senior leaders. The featured speakers for the main seminar were Masaaki Imai (founder of the Kaizen Institute), Yoshiki Iwata, Chihiro Nakao, and Akiro Takenaka. Mssrs. Iwata (d. 2001) and Nakao were former managers at Toyota subsidiaries, while Mr. Takenaka was a former production engineer. Iwata, Nakao, and Takenaka were affiliated with the “New Technology Institute.” The name “New Technology” is the English translation for “shingijutsu,” as in Shingijutsu Co., Ltd. These were the famous consultants under which I and so many others were trained. 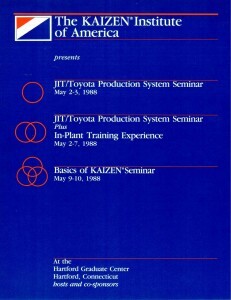 Take a close look at the brochure and notice the content of the seminars: Program A seminar “JIT/Toyota Production System,” Program B seminar “JIT/Toyota Production System Plus In-Plant Training Exercise,” and Program C seminar “Basics of Kaizen.” At that time, JIT and TPS were linked in a way that implies sameness, but they are not. Key parts of the training materials reflect Toyota training materials from around 1985 or 1986. They present both a systems view and a drill-down into the tools and methods that make up TPS. Notice the absence of training for value stream maps or A3 reports, neither of which were necessary to understand problems and improve flow. Finally, the training emphasized the important of management involvement in TPS, which we continue to struggle with today. Page one of the “JIT/Toyota Production System” seminar says: “Basic Concept (Roles of Manufacturing Department in the age of limited-quantity production).” The term “limited-quantity production” means that markets have shifted from sellers’ (“produce as many as one can produce”) to buyers’ (“produce as many as can be sold”). Recognizing Lean as a management system designed for buyers’ markets, and its disdain for economies of scale (for fear of overproduction), are critical points that most leaders today still fail to grasp. Iwata’s training session begins with the words: “Building GEMBA strong enough to cope with change: The Challenge to Flow Production.” Indeed. Look at the prices of the seminars on page four. In today’s dollars, the cost of the seminars would be about double the prices shown. That may seem expensive, but I’m sure that Koenigsaecker, Pentland, Cosentino, and Byrne would tell you that value greatly exceeded price. For most other attendees who did not (or could not) apply what they learned, price exceeded value. There is an important lesson in that as it pertains to the prevalence today of Fake Lean and failed Lean transformations. These seminars would be repeated over the next few years due to the high concentration of manufacturing businesses in the greater Hartford area. Additional seminars topics included Total Quality Management (TQM) and Quality Function Deployment (QFD). This represents just the beginning of what one needs to know to successfully introduce TPS to an organization.